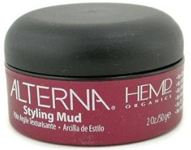 Alterna Hemp Organics Style Styling Mud is a rich and versatile clay based styling mud that is enriched with Hemp Seed Oil. It molds, sculpts, defines, shapes, smoothes, tames frizz, and leaves your hair with a beautiful glossy look. To use: Emulsify a generous amount in palms, apply to damp or dry hair with or without heat to combat humidity.